A farmer has nine animal pens arranged in three rows of three. Each pen must contain a cat, a pig, or a cow. 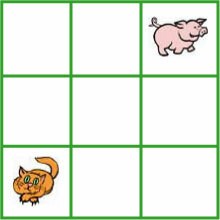 There is already a pig and a cat in two of the pens. The farmer wants you to fill the remaining pens so that no row or column contains two of the same animals.